Dogwood Farm has some of the best looking and most gentle school horses in the area. They also have lots of show experience. Clinton is a 16 hand grey gelding. He is half welsh and half thoroughbred. He was born on a pony farm in Virginia and was kicked off as he grew too tall. 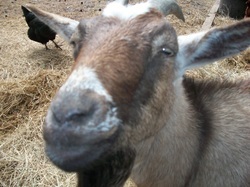 Clinton is 23 years old now and with his age has become a school master. He has been showing since he was 3 years old and loves his job. Everyone loves Clinton as he is an easy ride and has the smoothest canter. Star is a beautiful bay roan, 14.2 hand mare. She is half Arabian. Star is a "solid citizen" as anyone of any riding level can ride her. She is great with kids and she loves a trail ride. 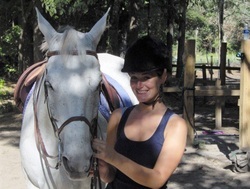 Prince is a 9 year old grey gelding, 14 hands. 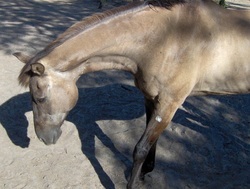 Half welsh and half paint, he is a registered Sport Pony. Prince is very athletic jumping 2'9" with beautiful lead changes. 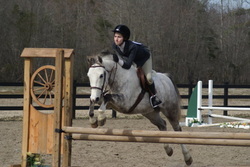 He is great for the beginner and experienced rider. Leo is the new horse on the farm. 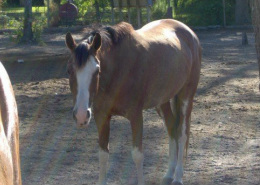 He is a 15 hand Quarter Horse gelding. He is proving to be a good school horse. He's really quiet and loves a trail ride. Rocky is a 9 year old 13.1 hand gelding. He is very althletic and loves to jump and play the "lead change game." His also quiet on trails. Duster is 33 years old and a retired hunter/jumper. He was great at his job and loved to show. Everyone loves Duster. Cowboy is a palomino Quarter Horse, 14.2 hands and 4 years old. He is very quiet and loves to jump. Cowboy is in training and very green. He enjoys a trail ride. 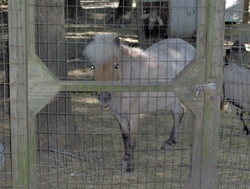 Spanky is 21 years old, 12 hand pony. He is ready to get back to work. Peanut is a miniature horse that thinks she's a goat. She is a very cute pet. Annie is a goat that thinks she's a miniature horse. She and Peanut are best friends. For more information, contact Betsy at 843-971-8336 or Betsys817@aol.com.